Christmas, Birthdays, Anniversaries... they're all hard for my husband to find just the right gift. Neither of us intend it, but there's this sort of unspoken competition to see who can give the gift that surprises, pleases, and fires you up for the next occasion. He is, more often than not, the one left open-mouthed as the wrapping paper falls away to reveal that caramel-colored bottle of Scotch-y goodness he'd had his eye on, or front-row tickets to the B.B. King show he was unaware was blowing through town. He, of course, does his best to shower me with the things I covet but can't justify buying for myself; expensive wine, frivolous craft tools... you get the idea. But this past Christmas, he truly shocked me. It wasn't a pricey present, nor something I'd pointed out in a store; instead it was a gift that I had no idea I wanted, or would appreciate, so much. As a side note, I have to admit that I generally have a small idea of what his gifts are, but as I tore into the paper, I was puzzled and couldn't help but wonder: "what on Earth could this be?" It turned out to be a magazine and a note indicating I would receive a subscription upon our return to Canada. Sure, it doesn't sound all that fantastic. It was just a magazine right? But, it wasn't just any magazine. It was a Food & Wine Magazine; not an easy-to-find publication in Taiwan and apparently quite the undertaking for my thoughtful husband. 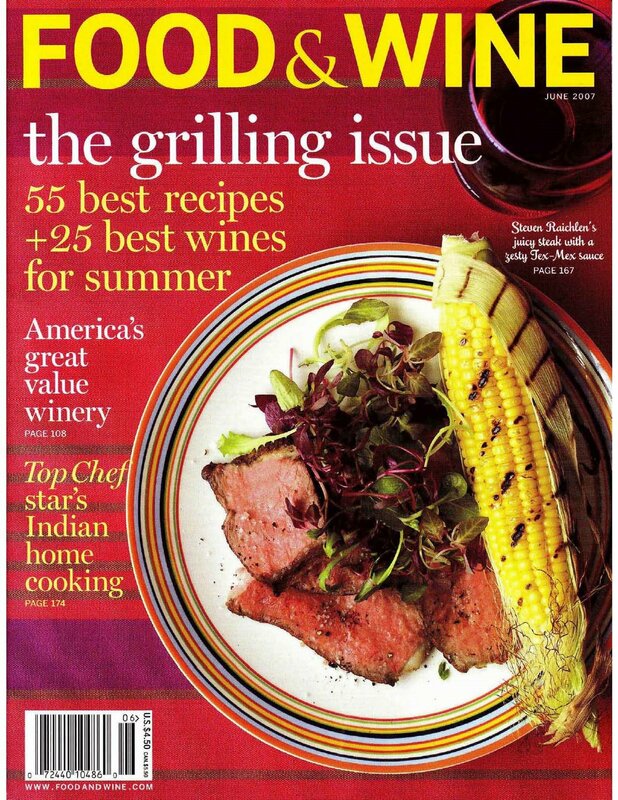 If you aren't familiar with this marvelous magazine and love, well, food and wine, I implore you to take thee to a Chapters and buy yourself one. Or pop online at http://www.foodandwine.com/. It is full of tips and inspiration for recipes, wine and cockatils, entertaining and home, gardening, even some travel. It has revolutionized my life and our meals. I have always been a fan of trying new recipes; searching for the one that amazes and yet is easy to execute and affordable. I am a big fan of Nigella Lawson, Jamie Oliver, and Gordon Ramsey... not because they're popular, attractive, or a bit cheeky. I like them because they keep food simple. And delicious. Food & Wine does just that. They offer luscious dishes that are uncomplicated and use fresh, in-season ingredients that you can often find at your local grocery store or Farmer's market. And wine recommendations to go with each of their recipes. It's eating and entertaining made easy. It's no surprise that my husband is as excited as I am when a new one arrives in the mail. 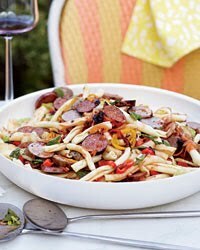 One of our favorites is the Pasta Salad with Grilled Sausages and Peppers. From kitchen to table in approximately 15 minutes, I can whip this up even after the most tiring days and grilling the sausage on the BBQ means less clean-up. Always a bonus. The well-balanced 2007 Vintners Blend Zinfandel from Ravenswood Winery with supple tannins and a long, fruit-forward finish makes for the perfect wet addition to round off the evening. Not to mention, it's a fairly sophisticated wine for it's very affordable price. And as a perk for those of you that search for locally grown or raised products, there is a superb, "Natural Beef; Field to Plate" butcher in Okotoks that offers up freshly-made sausages, in a variety of flavours, every Friday. They are the perfect selection for the above noted recipe. If you want to check them out yourselves, make the short trip to Okotoks to Hirsche Fraser Meats, located on Southridge Drive. You won't be disappointed! Now, back to my magazine... what will a try next?